I admit it, I am obsessed about pies. If I visit a new place one of my first thoughts will be to find out if there are any highly regarded pies. It was no different when I went on a stag do in Dublin over Easter. A quick internet search revealed the Pieman to be worth trying. However, it was such a fun filled weekend I was worried I might not get an opportunity. 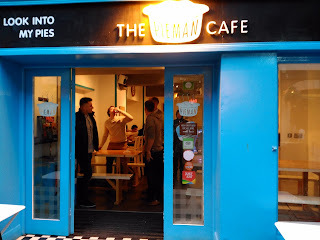 Fortunately The Pieman is located in the Temple Bar area which happens to be where a large amount of the pubs are. My luck was in when we went to The Temple Bar pub just around the corner. So while everyone was getting merry in a rammed pub, I thought no one would notice if I slipped away briefly, the perfect crime. Or so I thought. After I came back from my brief pie visit I realised everyone had gone! It took me some time to find them but served me right really for being rude enough to duck out the festivities! I eventually found them half way across the city, made all the harder by lack of internet on my phone because Dublin is apparently 'abroad'. But was the pie worth it? I went for the Chili Beef & Chorizo which was recommended by the staff. It was a decent effort but I regretted not having gone for a classic Steak & Guinness which would have given me a real taste of Ireland and also might have had a potential to score higher. 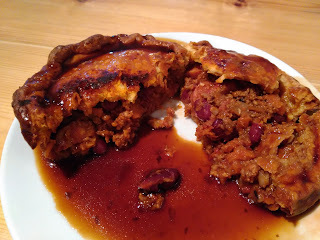 Whilst it was nice to tick off another country where we have reviewed a pie (we must be over a dozen or so countries by now) I probably wouldn’t go out of my way to have this one again. See the score break down below. Colour – 4.0 out of 7 – Straight away looking at this pie I realised I had made a bit of an error. It was swimming in gravy. It looked like the colour had been nice but the soggy appearance took the sheen off it somewhat. Condition – 3.5 out of 7 – A solid condition, no flaws to speak of. However, the gravy it was sat in was watery and I thought made it look unappealing. Cheapness – 3.0 out of 7 – I know that this is a pricey tourist area and that the post-referendum exchange rate is not good at the moment but I thought €6.50 was a lot of money for a pie on its own (roughly it was equivalent to £5.50). It was a sit in establishment but a cafe rather than a restaurant. Capacity - 5.2 out of 7 - As you might expect for a premium pie, it was quite a good size and it was also well filled. Chewiness - 4.5 out of 7 - Minced beef was used which didn't provide as much to get your teeth into. However, there were also chunks of chorizo which were a bit more satisfying. The pieces of carrot seemed a bit limp to me. Despite the gravy, there was quite a nice biscuity crunch to some of the less damp pastry, particularly the thick crimp at the top. Content - 4.5 out of 7 - The mixture of beef, beans, carrot, onion and chorizo gave the filling a nice variety but it was still satisfyingly full of meat. The flavour was quite spicy and also quite salty. It was a shame the gravy didn't go with the taste of the pie filling but I have tried to ignore this in my score. Consistency - 4.0 out of 7 - The pie held together well and I think the filling, although slightly more unusual, went well with the pastry.